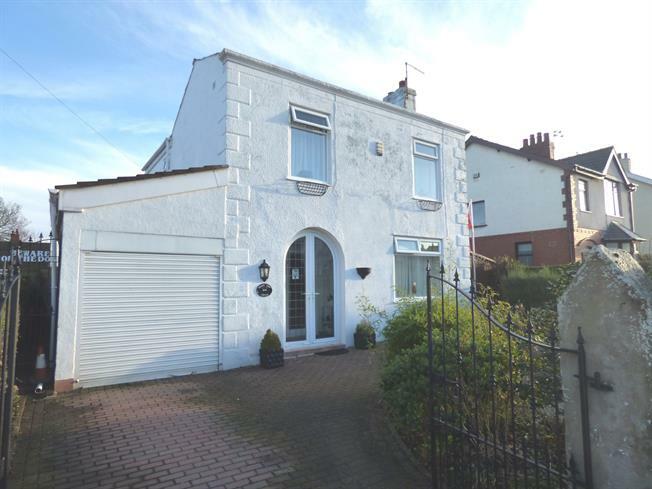 4 Bedroom Detached House For Sale in Preston for Asking Price £200,000. Extended and well presented three / four bedroom detached family home built historically in 1834 and was the original house on Stuart Road. Boasting spacious living accommodation offering many options and an extensive rear garden. No chain delay and viewing highly recommended. The deceptive accommodation briefly comprises; hallway, lounge, dining room, sitting room/bedroom four, downstairs bathrooms, kitchen, to the first floor, three bedrooms and four piece family bathroom. Double glazing and gas central heating system, driveway, garage and extensive rear gardens. Call now to arrange your viewing. UPVC door to the front, radiator, laminate flooring and under stairs storage. Double glazed window to the front, wood mantle, marble hearth and back with living flame gas fire, radiator. Double glazed patio doors to the rear and window to the side, wood mantle with living flame gas fire and laminate flooring. Double glazed window to the side, bath, wash basin, low flush wc, space for washer, storage cupboard housing the boiler and tiled flooring. Double glazed window to the side and patio doors leading onto the rear gardens, range of wall and base units with complementary work surfaces, stainless steel sink and drainer, gas cooker point, part tiled walls, space for dishwasher and tiled flooring. Staircase leads from the hallway to the first floor landing, double glazed window to the side and radiator. Double glazed window to the front and rear, radiator. Double glazed window to the front, radiator and laminate flooring. Four piece suite comprising; bath with shower over, wash basin, low flush wc, bidet, part tiled walls, tiled flooring, heated towel rail and double glazed window to the rear. Driveway to the front providing off street parking leading to the garage. To the rear is an extensive garden with paved patio and lawn with shrub borders and greenhouse.